Heat oven to 350°F. Place pork on rack in shallow roasting pan. Sprinkle with 1/4 teaspoon salt and the pepper. Bake uncovered 30 to 40 minutes or until pork has slight blush of pink in center and meat thermometer inserted in center reads 160°F. Cool pork; cut into slices. Meanwhile, in small bowl, mix yogurt, cilantro, lime juice, oil, sugar and 1/4 teaspoon salt until well blended; set aside. 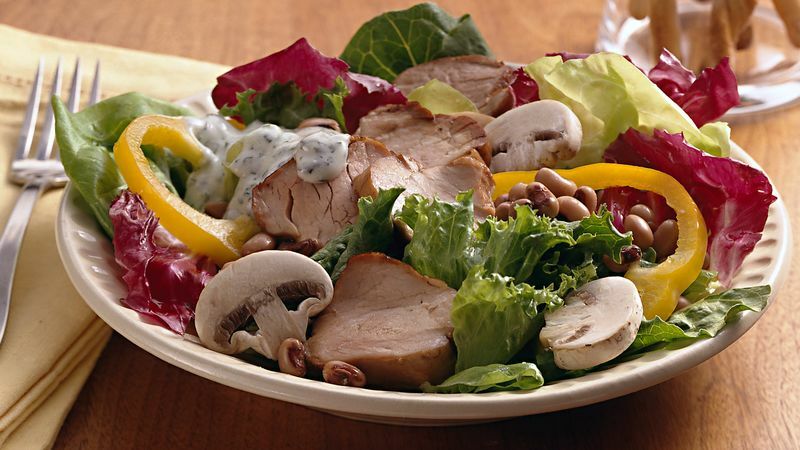 On large serving plate, arrange salad greens, bell pepper, mushrooms and peas. Top with pork slices. Serve with dressing. The combination of pork, vegetables and peas in this recipe has created a very nutrient-dense, carbohydrate-controlled main-dish salad. That means for the calories it contains, it provides heaping amounts of protein, vitamins A and C, calcium, iron and fiber! Cook pork and cool. Make Creamy Lime Dressing. Prepare vegetables. Refrigerate all ingredients no longer than 48 hours. Just before serving, continue as directed in Step 4. Yoplait is a registered trademark of YOPLAIT MARQUES (France) used under license.